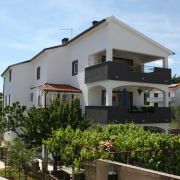 Family Apartments Kraljic are located in the town of Krk, only three hundred meters from the city center. House … More » is in a beautiful and tranquil environment with extremely lot of greenery. Far from the hustle and bustle of the city and yet so close, to a couple of minutes, from the sea. Apartments on the island of Krk in Kvarner Bay. AP1, 62m2, for 4-6 persons, on the 2nd floor with sea view. 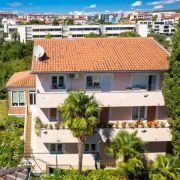 AP2 … More » , 48m2, for 2-3 persons, on the 1st floor with a view of the green. AP3, 78m2, for 4-5 persons, on the 1st floor with sea view. Krk offers many options for your holiday. Apartments Hajl are located in town Krk, just 400 meters from the beach and the center. 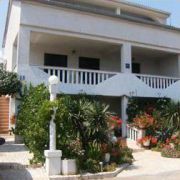 The house is ideal for … More » families because it is located in a quiet place, but also close to all necessary services (restaurants, cafes, beach, shops). Apartment in the immediate vicinity of the historic town Krk - distance from the center is 3km. The apartment is … More » newly renovated and offers accommodation for 4-6 persons in two bedrooms and an extra bed in the living room. The apartment has a bathroom with toilet and a separate toilet.